A small, intensely passionate university, Antioch is the perfect place for students who want to change the world as well as their careers. While Antioch had plenty of heart, it lacked the budget to compete with bigger-name universities. D Zone has identified a powerful, cost-effective and previously untapped marketing resource for the critically acclaimed university: its students. 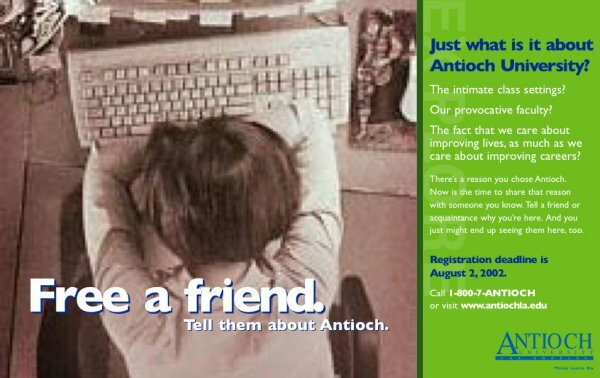 Fiercely loyal and fanatical about Antioch, the students could do more than spread world peace. They could spread the word about Antioch. 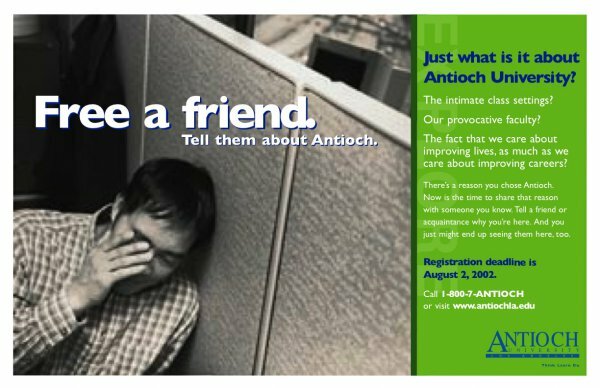 I was hired to develop the concept for a series of posters to be posted around campus, encouraging students to “free and friend” from the confines of stagnant, meaningless jobs, simply by telling them about Antioch.